So I have this friend. 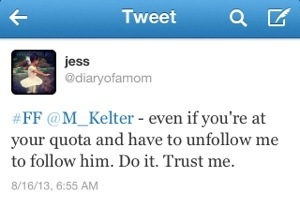 A guy who goes by M Kelter. It’s kind of a funny friendship, I suppose, as we’ve only actually met once. But that’s never seemed to matter much. He was one of the first autistic people who I came to know through these here Interwebz. His story, when I came into it, was tough to read. It was mostly tough because his writing is so damned good that when he writes about hard stuff, it’s really, really hard. And he’s been through some really, really hard stuff. And he writes about it really, really well. You see, he wasn’t diagnosed with Asperger’s until he was thirty. And there’s a lot of baggage that comes along with walking through life not knowing why things just don’t always compute, not being able to put your finger on the thread of difference that runs through everything – every perception, every interaction, every relationship, everything – that you do and see and feel and taste and smell and know and are. When I found him, he painted with words. On a quiet back backdrop he drew scenes in delicate white ink. It’s weird, but I imagined him etching the words onto the screen, acid so gently, slowly, precisely carving out the stone – and in so doing, opening a portal to wherever it is that he decided to take us that day. There we’d be, innocently sipping a latte at our laptops and then suddenly we were watching a sparrow from a park bench, avoiding conversation in a dark, smoky bar, trying to hide in plain sight at an awkward and stilted family reunion. With his palette of letters, M brought us all along on his journey to the intersection of reality and perception, to the axis where what we feel is all there is and who we are is defined only by who we decide that we can be. He took us to the brink of suicide and back. To doctors with no right to the title and then finally, to the one who dispensed redemption in a daily dose of self-knowledge, understanding, and acceptance. He wrote about social society like de Tocqueville wrote about America – as a traveler passing through, looking from the outside in with a wry sense of humor and a keen objective eye that afforded his commentary an honesty that no one on the inside could ever have hoped to emulate. He made us laugh at our own pretenses and social niceties, see the absurdity in our elaborate rituals to prove .. what exactly, it seems we’ve never really been sure. My daughter is very, very different from M. With rare (yet admittedly stunning) exception, I didn’t “see her in his writing,” especially back then. I didn’t jump up and down with recognition, or a sudden understanding of a quirk, with insight into why she scripted or hummed or cried hysterically when I asked her what color the cow in the board book was. That was never why M’s writing struck such a deep chord with me. Because I saw and see ALL OF US in his writing – in him. I see a story of a child who folded in on himself because no one ever told him that it was okay to be who he was. That a name for his differences wasn’t what mattered; that what did matter was HIM. That his perspective was worthwhile. That he was brilliant and funny and interesting and that not having an innate understanding of conventional interaction would not preclude him from making meaningful connections in his own way. I see a cautionary tale of what happens when we prize conformity and shut down difference. When we throw our kids to sink or swim without first showing them how to keep their heads above the waterline. I see a life that is so damned much harder than it ever needed to be. I see years in the dark. And I see just how incredibly, doggedly, breathtakingly resilient we are. I see how much we can grow and evolve and seek the light even after years of keeping it out, working in the darkness and securing sheets over windows to keep the sun at bay during the day. I see how much we can do and create and achieve when we begin to understand and accept ourselves. I see how much it matters that we all support each other in that endeavor. I see how much richer the world is for the Ms in it. I see a man who, after all that he has been through, has come out the other side hopeful and funny (did I mention funny, cause seriously, funny) and generous and complicated and brilliant. I see my friend, emerging, in his own way, as an advocate, not just for others on the autism spectrum, but for all of us – for a world that he knows can be better. It’s a world that I want to live in too. To that end, he’s started a new blog called Invisible Strings. He’s got a fledgling Facebook page. And he’s even giving a go at Twitter where he writes Tweets like “Your social forecast for today: small talk warnings in effect till noon; 60% chance of awkward” and makes up awesome hash tags like #stillconfusedbyhashtags. See? Told you he was awesome. So look him up, won’t you? Subscribe to his blog, like his Facebook page and follow him on Twitter. And help him on his mission to peel the sheets off the world’s windows. So, to be clear, let’s make this legal and binding, folks — the management of this blog (ya know, me) will not be held responsible for any blog crushes that ensue from heretofore aforementioned awesomeness nor any awkwardness – real, perceived or otherwise, pursuant to said aforementioned um yeah. He sounds amazing and I’ll take the risk of crushing on him and check out his writings. Thanks for sharing. well luckily I am not the jealous kind, but if he asks another blog to prom now I might just cry alone in my room a little. I’ve read much of his earlier blog (which I must have gotten from your blog roll since his blog comes after yours in my bookmarks). There are some devastating entries in there. And some pretty funny ones too. I’m so glad you linked to his new blog. Can’t wait to read it. Thank you, thank you, thank you Jess for connecting us to him. Life is interesting. Although parenting my five year old spectrumite is difficult–as we all know, this world isn’t exactly set up for spectrumite success–I have found that my son and I being ver, very close and on a very similar page have a lot in common–including the boxes we check. Thepast few months, I have been digging deeper into myself–dragging my closest, longest friends and my parents along for the journey of discovey and I am realizing as some parents of spectrumites do–exactly how much my son seems to have inherited from me….if you know what I mean. I would be, if we were still DSM IV an Aspie. My intelligence and my ability paint language in person has helped me to bobble on along okay. I always knew I was very different. All of my close friends were very well aware of it–often describing me as a one in a million, something else, so far out the box it can’t be seen on the horizon…..I have a good internal toolbox that reading and people watching helped me to create. I have friends who loved me enough to scaffold me the rest of the way. I have been quietly seeking someone, an adult like me, who might have some insight into what its like to be my kinda checked boxes. I think you may have helped me find one. I think, I too am bloggy starry-eyed :). oh how i love this. love, love, love this. welcome home. i was very humbled and moved reading this, thx jess. you’ve helped give the words friendship and community meaning in my life and for that i am grateful. and you me, my friend.